This entry was posted in candle making supplies, Christmas Scents, Fragrance Oils, Natures Garden, Natures Garden Fragrance Oils, Soap making supplies and tagged bath and body products, body safe fragrance oils, candle making, candle making supplies, christmas cabin fragrance, christmas cabin scent, christmas crafts, Christmas fragrances, christmas ideas, Christmas scents, christmas time, christmas time fragrances, Christmas time scents, country christmas, country christmas scents, crafts for christmas, crafts for kids, feelings of country christmas, feels like christmas, fragrance oils, homemade, house smell good, kid friendly craft recipes, kid friendly crafts, kid friendly ideas, natures garden, smells like christmas, soap fragrance oils, soap making, soap making supplies, wholesale fragrance oils on November 29, 2014 by Deborah Ward. Hello everyone! Have you picked out your Christmas tree yet? Or maybe you’re already all finished decorating it! Do you like to put up your Christmas decorations ahead of time so that the Christmas spirit can be in your house for even longer? Well, here at Nature’s Garden we are just full of the Christmas spirit! We cannot wait for Christmas to get here! Are you looking for the perfect fragrance to use in your gifts or projects to use for this Christmas season? Well Christmas Cabin scent is just that scent! It is sure to be the perfect scent to bring that homey country Christmas feeling to you and yours for the holidays! What Does Christmas Cabin Smell Like? 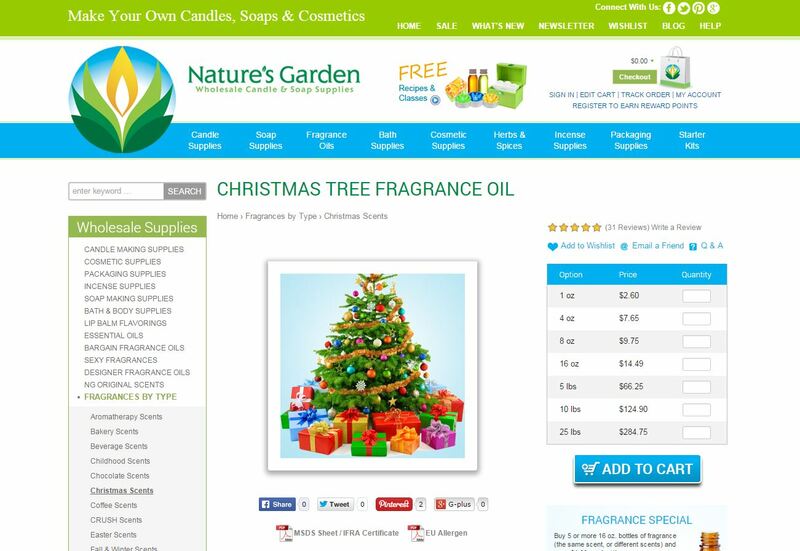 Christmas Cabin by Nature’s Garden is a best selling NG original fragrance oil! It is a wonderful aroma that is a blend of cranberries and bayberries with hints or orange zest and top notes of freshly crushed cinnamon bark! 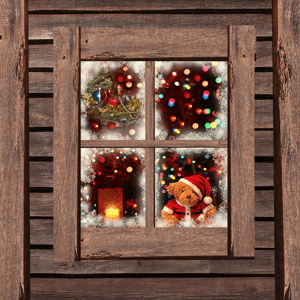 How Do Our Customers Use Christmas Cabin Fragrance Oil? It’s finally time for the smells of hot chocolate and eggnog to fill your houses, and Christmas Cabin is the perfect scent to bring in that country Christmas feeling! For all of the candle makers out there, this fragrance is just right for your holiday projects! It works nice and strong in soy wax and performs perfectly in joy wax and wow wax! Christmas Cabin even has a 50% maximum usage rate if you want to use it in incense and potpourri recipes! You can even fill your house with the feeling of a comforting country Christmas by using this scent in some nice and strong aroma beads! When you use this fragrance in bath and body products, it has different maximum usage rates for different products. Common products it can be used in are lotions, bath gels, perfumes, soaps and bath oils. When used for soaps, bath oils, and bath gels Christmas Cabin has a maximum usage rate of 1%. When used in lotions and perfumes, this fragrance has .5% maximum usage rate. For all of the cold process soapers out there, Christmas Cabin scent is perfect for you! Our CP findings are: it has a slight separation and some acceleration, however using a stick blender will blend it right back in. It does discolor products to a light caramel color, but is has a very nice Christmassy scent! It also has no vanillin content! Do you love the country Christmas look and style? Well then Christmas Cabin is the perfect fragrance for you for this holiday season! It is sure to bring all the comforts of home along with it and the thoughts of hot chocolate and yummy glasses of eggnog! The easiest way to get your hands on this great fragrance is by typing “christ cabin” into the search bar on our site. It will take you directly to our Christmas Cabin fragrance page! Make sure to check out all of our wonderful free recipes and classes as well! You are sure to find some amazing ones to go right along with your own little country Christmas! Enjoy the holiday season as long as possible and be sure to watch for more Enlightened by Layla! This entry was posted in bath and body, bath products, cosmetic clay, free recipe, Natures Garden, Soap making supplies and tagged all natural, bath and body recipes, beneficial clays, benefits of cosmetic clay, clay for cosmetics, clay for face masks, clay for facial masks, clay recipes, clays, clays that draw out impurities, clays that moisturize, clays to draw out toxins, clays to use in a facial mask, cosmetic clay advantages, cosmetic clay benefits, cosmetic clay crafts, cosmetic clay recipes, cosmetic clay uses, cosmetic clays, crafts for a rainy day, face mask ingredients, face mask recipes, face masks with cosmetic clay, facial mask ingredients, facial mask recipes, free cosmetic clay recipes, free face mask recipes, free facial mask recipes, free recipes, homemade, homemade face masks, homemade facial mask recipes, natural face mask, natural facial mask recipes, recipes, uses for cosmetic clays on November 24, 2014 by Deborah Ward. Hello all you wonderful people out there! Are you looking for a new idea for new crafts and projects to try? Or maybe some new products for every day use? Well, have you ever tried any projects with clay? French Green clay specifically? This awesome product will make a great gift or surprise for all of your friends and family! It is sure to leave them and your customers coming back again and again! French Green clay is amazing and has so many wonderful uses, just read on to find out! Illite Clay, better known as French Green Clay is mined from quarries. The quarries can be anywhere from 100 to thousands of feet! It is found in Wyoming, Montana, China, and many European countries including of course, France! French Green Clay includes many elements that are very important for your health such as magnesium, phosphorous, silicon, silicon, calcium, manganese, selenium, iron, dolomite, copper, silica, and potassium. Did you know that French Green Clay is sometimes also called “marine clay?” This is because the quarries it is mined from are actually found sometimes in ancient marine beds! French Green Clay has a very high absorption rate and is awesome at working to detoxify the body. It can be used in many common bath and body products such as soaps, bath bombs, feet deodorizing treatments and even mineral baths. French Green Clay actually contains decomposed plant material which makes the clay very healthy and nutritious for the skin. It has many medicinal benefits for the skin such as being used in soap recipes to help cleanse and exfoliate the skin. 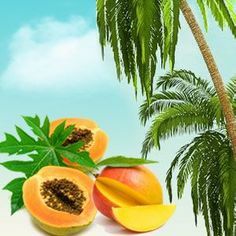 It also helps to relieve sunburn, shrink the size of pores, remove any impurities from the skin, stimulate blood flow and it also gives the skin a nice glow. French Green Clay has even more medicinal benefits though! It can detoxify the body of harmful toxins that cause digestive problems, headaches, fatigue and even food allergies. This clay has even been used as a treatment for salmonella and a disease that causes stomach ulcers called Buruli Ulcer. (Buruli Ulcer eats away at the fatty tissue in the stomach, which causes the ulcers.) Really, how much more awesome could this clay be for you? Are you wondering how you can get your hands on this fantastic product as soon as possible? 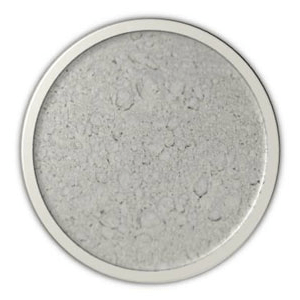 Well, all you have to do is type “french green” into the search bar on our website and it will take you right to our page for French Green Clay. But wait just a second, because this products gets even better! We offer many free classes and recipes here at Nature’s Garden, and our Refreshing Face Mask and our Soothing Facial Mask are both made with French Green Clay! These amazing recipes are sure to be a perfect gift for this holiday season! They are sure to help everyone you know relax and wind down from the stress of the holidays! Please contact us with any thoughts or concerns you have, and don’t forget to keep watching for more Enlightened by Layla! This entry was posted in candle making supplies, Christmas Scents, Fragrance Oils, Natures Garden Fragrance Oils, Soap making supplies and tagged bath and body products, body safe fragrance oils, candle making supplies, candles, christmas, christmas crafts, christmas fragrance, Christmas fragrances, christmas fun, christmas gifts, christmas ideas, christmas recipes, Christmas scents, christmas soap, christmas time, christmas time ideas, crafts as a hobby, crafts for christmas, fragrance oil, fragrance oils, frankincense, frankincense and myrrh, frankincense and myrrh fragrance, frankincense and myrrh scent, frankincense and myrrh soap, free christmas recipes, free christmas soap recipe, free recipe, homemade, myrrh, natures garden, recipes for christmas, soap making supplies, soaps, time for christmas, wholesale fragrance oils on November 21, 2014 by Deborah Ward. Frankincense and Myrrh is a beautiful fragrance that represents the very special story of the baby Jesus himself. It is a wonderful way to bring the real meaning of the holiday into your home. In the Christmas Story, after Mary has given birth to the baby Jesus, three wise men, or other wise known as the three magi, come to visit the baby. They come bearing three special gifts: gold, frankincense, and myrrh. Gifts fit for a King! Frankincense and Myrrh scent is amazing scent that is perfect for all of your holiday projects and gifts! It is a great way to remind people of the real meaning of Christmas! What Does Frankincense and Myrrh Smell Like? Frankincense and Myrrh by Nature’s Garden is a wonderful and rich combination of vanilla, sheer musk, herbaceous woodsy pine, olibanum, patchouli, myrrh, floral notes of lilac. 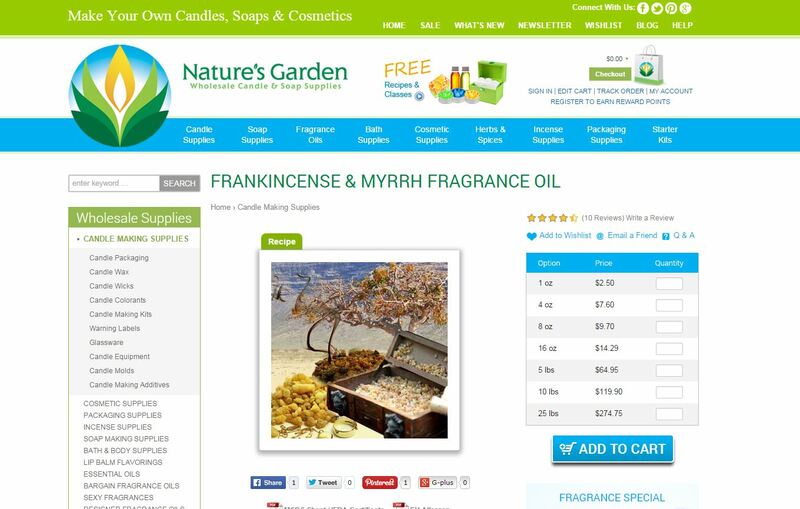 How Do Our Customers Use Frankincense and Myrrh Fragrance Oil? With the day that the baby Jesus was brought into the world bring just around the corner, Frankincense and Myrrh scent is the perfect way to pay homage to this most glorious of days. If you would like to use this fragrance for candle making, it is nice and strong in soy wax and performs perfectly in joy wax and wow wax. 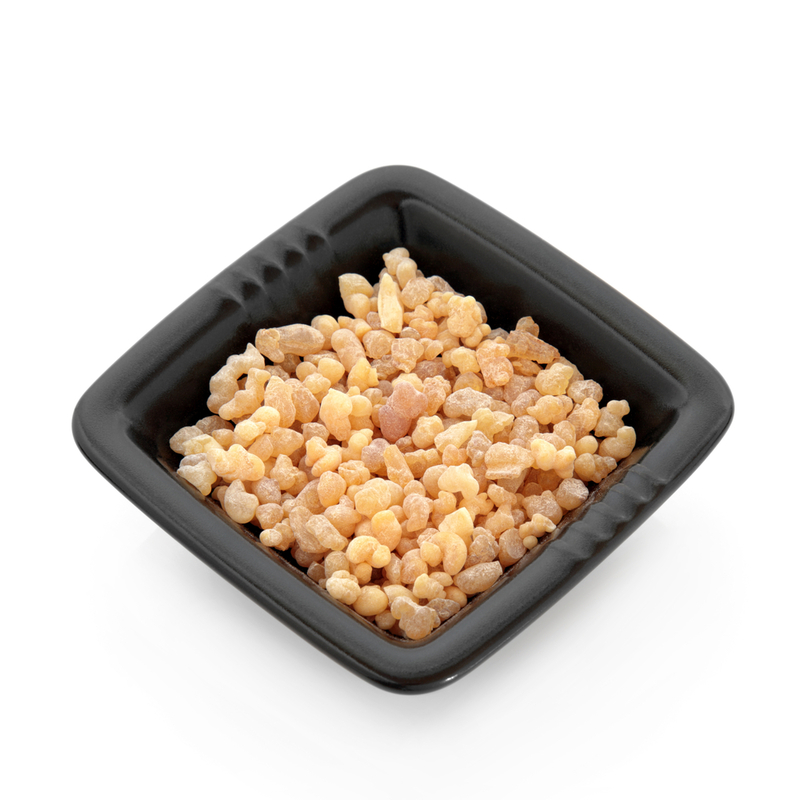 If you are into making incense or potpourri, Frankincense and Myrrh has a maximum usage rate of 50%. You can even bring a memory of the Christmas story to your whole house by using this scent it is nice and strong aroma beads! For bath and body products, Frankincense and Myrrh scent has a maximum usage rate of 5%. It can be used in many common bath and body products such as soaps, lotions, bath gels, perfumes, and bath oils. However, Frankincense and Myrrh does have a vanillin content of 6% meaning that it will discolor your soaps and bath body products to a very dark brown color. You can try out Vanilla White Color Stabilizer to help prevent discoloration. For all the CP soapers out there, this fragrance is perfect for you for this holiday season! Our CP findings are: no acceleration or ricing, it will discolor your products to a very dark brown color, and it has a perfect pour! Frankincense and Myrrh scent is the perfect fragrance for the Holiday season! Use it in any gifts or products to help your loved ones really remember what this holiday is all about! But hold on a minute, because it gets even better! We offer many free recipes and classes here at Nature’s Garden, and our free recipe for Frankincense and Myrrh Soap just so happens to be made with Frankincense and Myrrh Fragrance Oil! This soap is perfect for Christmas time! The easiest way to get a hold of these awesome products is by typing “frankin” into the search bar on our website. That will take you directly to our Frankincense and Myrrh Fragrance Oil page. On the top of the fragrance picture will be a little green link that says “Recipe.” That will show you the name and picture of our Frankincense and Myrrh Soap. That link will take you right to our free recipe! Enjoy these amazing products and please don’t forget about the real meaning of Christmas! 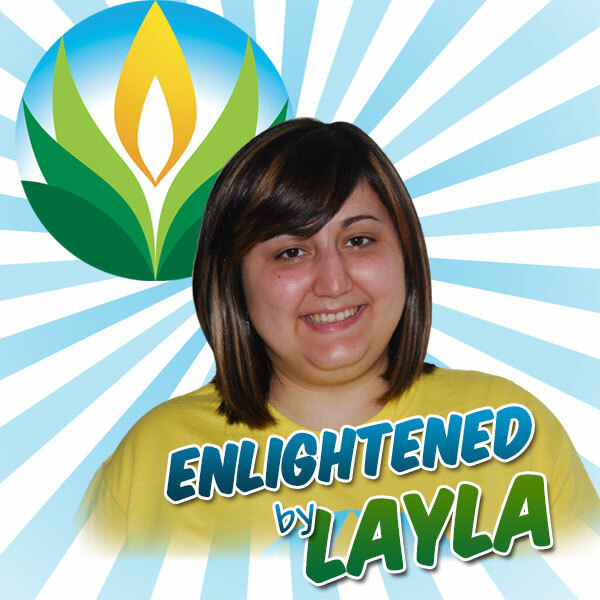 Make sure to watch out for more Enlightened by Layla! This entry was posted in bath and body, bath products, clays, cosmetic clays, Natures Garden, Soap making supplies and tagged bath bomb recipes, benefits of bentonite clay, bentonite clay, bentonite clay advantages, bentonite clay in cosmetics, bentonite clay uses, christmas craft ideas, christmas ideas, clay in cosmetics, clay uses, cosmetic clay, cosmetic clay advantages, cosmetic clay benefits, cosmetic clays, crafts as a hobby, crafts for a rainy day, crafts for kids, free bath bomb recipes, free bentonite clay recipes, free clay recipes, free craft recipes, free recipes, free shaving cream recipes, health benefits of cosmetic clay, how to use bentonite clay, kid crafts, medicinal benefits of cosmetic clay, natures garden, natures garden recipes, rainy day crafts, shaving cream recipes, uses for bentonite clay, uses for cosmetic clays on November 20, 2014 by Deborah Ward. Hello everybody! Is your house all decorated for Christmas yet? Are you ready for the holiday season to arrive? Well, it is just around the corner! Yes, it is almost time for Santa to come and to open all those wonderful presents around the tree! I’m sure Santa is getting all of his reindeer ready for their famous night as we speak! It’s time for Christmas caroling and delicious Christmas cookies, and time to celebrate the day of Jesus’ birth! Are you still looking for some awesome cool gifts or projects to give all of your loved ones for the holidays? Well, have you ever tried anything with cosmetic clay before? Bentonite clay to be specific. If you haven’t, you should definitely get on that! We also have many fantastic free recipes made with Bentonite clay that would make the perfect and unique Christmas gift! 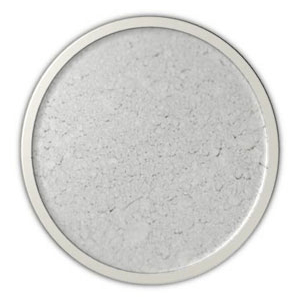 Bentonite clay is a naturally forming impure absorbent aluminum phyllosilicate clay that contains high amounts of sodium. In 2011, the United States was the top producer world wide for Bentonite clay. Bentonite clay was named in 1898 by Wilbur C. Wright after the Cretaceous Benton Shale that is near the city of River Rock, Wyoming. It is often referred to as Montmorillonite and is one of the most powerful and effective healing clays on the Earth. It is normally a grayish or beige color, but turns an olive color when water is added to it. There are many different cosmetic and bath and body products that can include Bentonite clay. 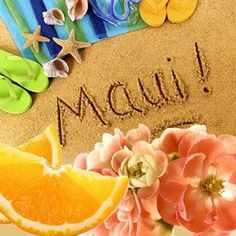 Common products it can be used in are bath bombs, lotions, soaps, and face masks. Since it is one of the most effective and powerful clays in the world, it has countless health and medicinal benefits. Bentonite clay can be used as a treatment for many conditions such as diarrhea, colitis, anemia, ulcers, cataracts, arthritis, and many food allergies and parasites. It has many skin care benefits such as cleaning impurities, removing oils, and softening the skin. It helps with many irritations like burns, cuts, and even insect bites. Bentonite clay even helps to relieve the itching caused by chicken pox, many rashes, eczema, and psoriasis. Pregnant women can use bentonite clay to help ward off morning sickness. Your teeth can even benefit from the use of bentonite clay. It whitens them and provides them with many essential minerals. When used in baby powder, the clay helps with the problems caused by infection and reduces redness. 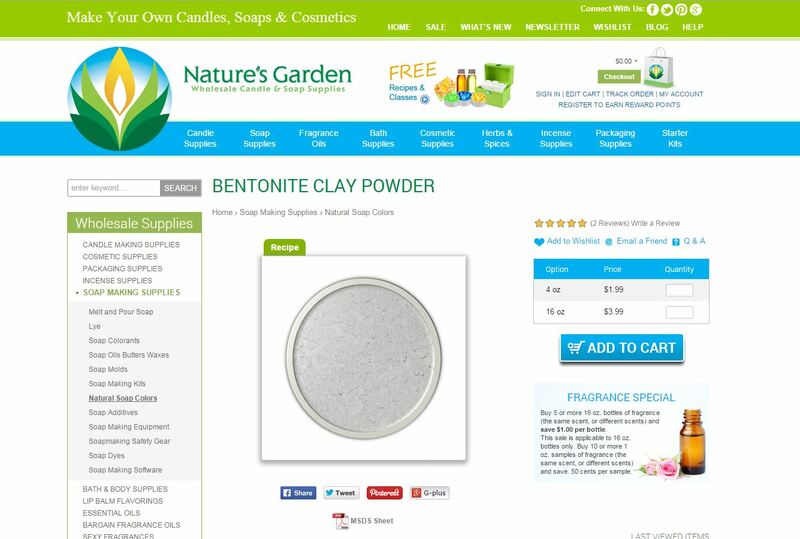 Make sure to check out all of our awesome free recipes made with Bentonite clay! We have our Hatching Dinosaur Egg Bath Bombs recipe, our Whipped Shaving Cream recipe, our Fish Toy Bath Bomb recipe, our Cold Process Shaving Cream recipe, and our Freshly Ground Coffee Bath Bombs! They are all wonderful recipes that would be the perfect gift for all of your friends, family and even your customers for this Christmas season! Don’t pass up on this awesome product, try it out as soon as you can! 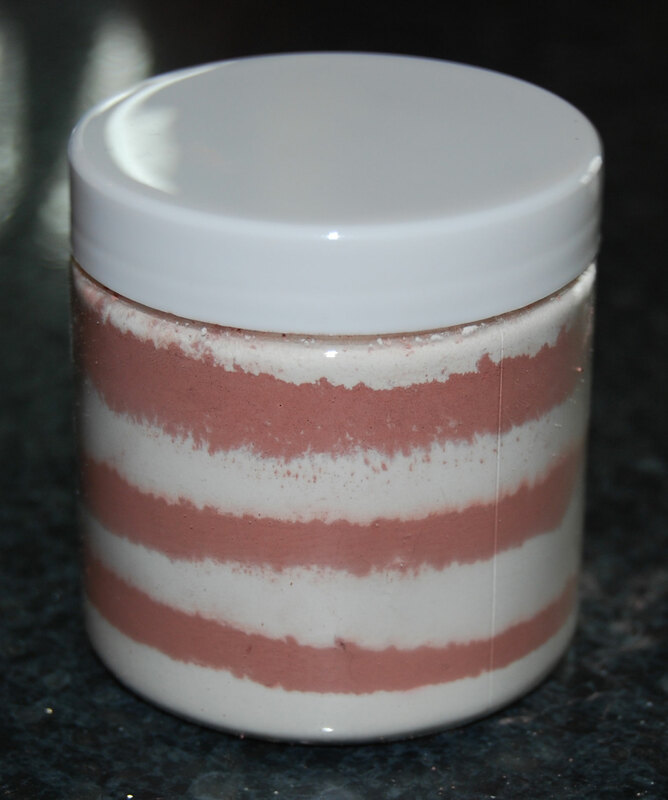 Just type “bento” into the search bar on our site and it will take you directly to our Bentonite Clay Powder page! On top of the picture is a green box labeled “Recipe” that shows the names and pictures of the free recipes. Those pictures will link to those recipes! Please don’t hesitate to contact us with any questions, concerns, or thoughts, and make sure to watch out for more Enlightened by Layla! This entry was posted in arrowroot, bath and body, bath products, facial masks, hibiscus, Natures Garden and tagged bath and body products, candy cane, candy cane face mask, candy cane facial masks, candy cane recipes, christmas candy cane recipe, christmas crafts, christmas face mask, christmas facial masks, christmas fun, christmas gift ideas, christmas ideas, christmas recipes, christmas time, christmas time ideas, crafts as a hobby, crafts for christmas, face masks, facial mask recipe, facial masks, facials, free candy cane recipes, free christmas recipes, free face mask recipe, free facial mask recipes, hibiscus advantages, hibiscus powder, hibiscus uses, hibsicus, homemade facial masks, ideas for christmas on November 19, 2014 by Deborah Ward. It’s almost here! That awesome day of the year when there are presents everywhere and all kinds of yummy delicious food…yes Christmas! Snow and cold…but all leading up to that gloriously wonderfully fantastic day! But before it actually gets here, are you in need of a great holiday project to try before the holidays? Maybe a good new recipe for you and your friends and family to try out to show your Christmas spirit? Or maybe you’re just looking for something new and exciting to give to all of your loved ones? 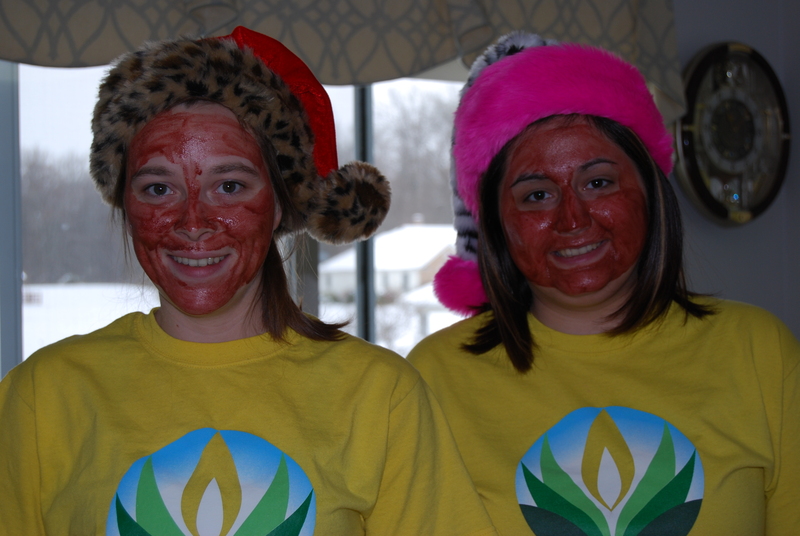 Well, we would like to introduce our Candy Cane Facial Mask! It is the perfect way to celebrate the holiday season! 1. To prepare the pink part, combine and mix 7 grams of Beet Root Powder, 1 drop of Peppermint Oil, 32 grams of Rose Clay Powder, 3 drops of Vitamin E Oil and 9 grams of Hibiscus Flower Powder. 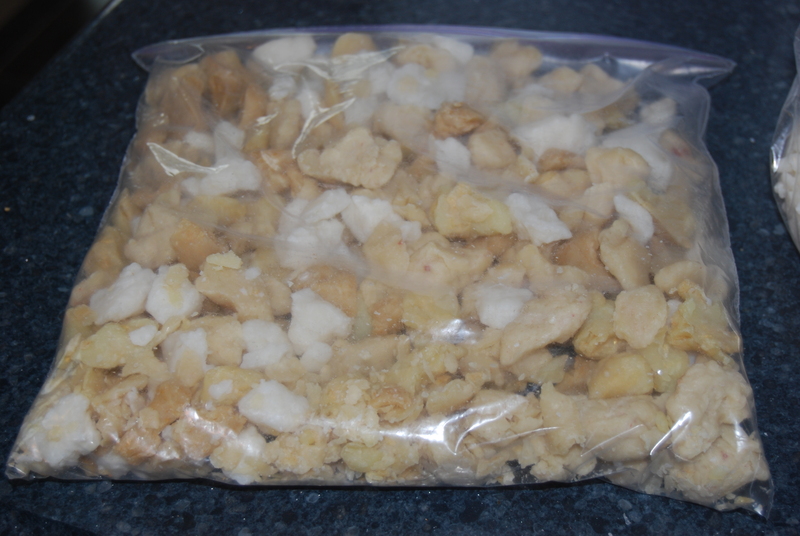 Once it is all mixed together, set it aside to use for later. 2. Now to prepare the white part, combine and mix 6 grams of Vanilla Powder, 2 grams of Safflower Oil Powder, 25 grams of Kaolin White Clay, 3 drops of Vitamin E Oil, and 2 grams of Arrowroot Powder. 3. Next take the 4 oz. 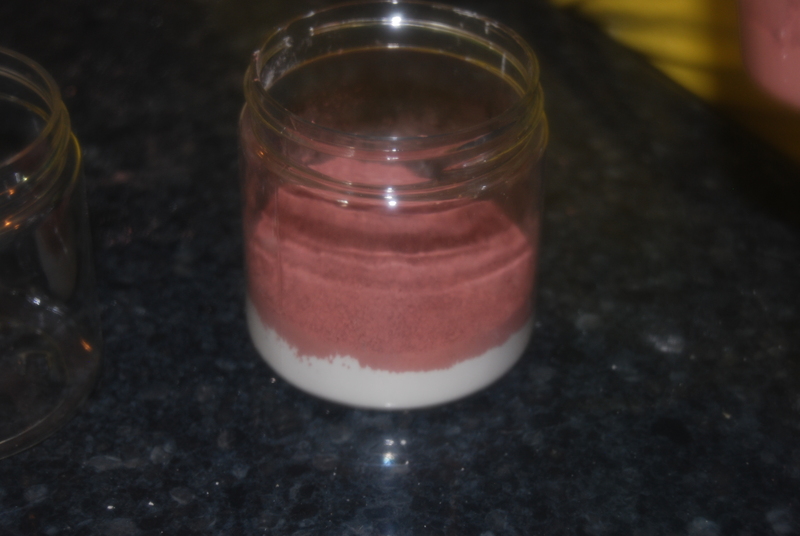 PET jar and begin to carefully layer the pink and white powders. You can more easily keep the layer separate by packaging them down. Then when the jar is completely filled, you can go ahead and put the lid on top. 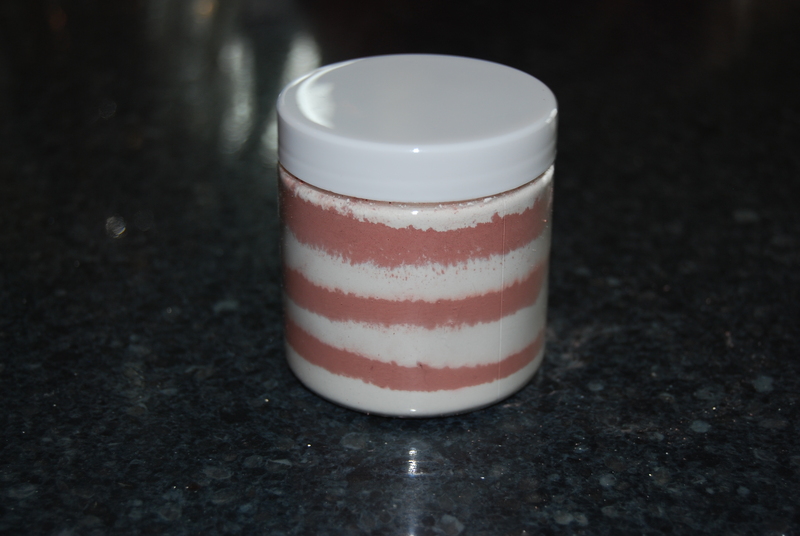 Remember how we added Hibiscus Flower Powder to the Candy Cane Facial Masks? Well, did you know that hibiscus has actually been called “the natural Botox plant?” No, I’m not kidding! Hibiscus is actually amazing for your skin! It helps to soften and smooth it out and also is a great cleanser that helps to even out the textures and tones of your skin! Go check out our free Hibiscus Class and learn even more about this awesome plant! And while you’re at it, check out all the rest of our free classes and recipes as well! But this Candy Cane Facial Mask is a Christmas project that you simply cannot turn down! Everyone you know is sure to love it! Please contact us if you have any questions or concerns and watch out for more Enlightened by Layla! This entry was posted in bath and body, candle making supplies, herb, herbs, Natures Garden, Soap making supplies, Uncategorized and tagged bath and body, bath and body products, bible herbs, biblical herbs, candle making supplies, candles, christmas herbs, christmas ideas, christmas time, crafts as a hobby, dried herb use, free recipe, herb uses, herb uses in candles, herb uses in cosmetics, herb uses in soap, herb uses in the bible, herbal uses, herbs, herbs for christmas, herbs in bath and body products, herbs in cosmetics, herbs in soaps, herbs in the bible, homemade, homemade soap, house smell good, natures garden, soap making supplies, uses for herbs on November 18, 2014 by Deborah Ward. With Christmas right around the corner, there is so much to do to get ready for it! 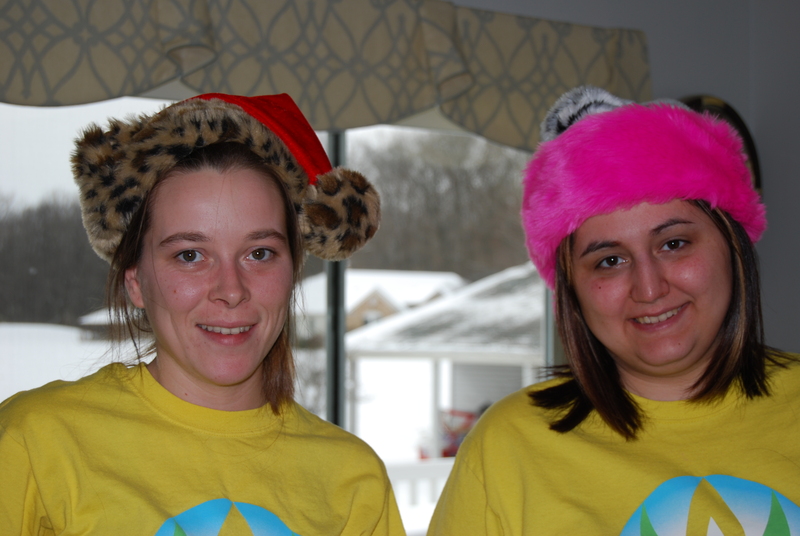 Decorating, presents, making Christmas cookies, and the list goes on! Are you working on any new and exciting holiday projects? Or maybe you’re looking for a new unique gift to give to your loved ones for the holidays that is a way to remind them of what the Christmas season is really all about? Well, maybe you could try something with herbs! It just so happens that there are many herbs that have been used since Biblical times and are referenced in the Bible! 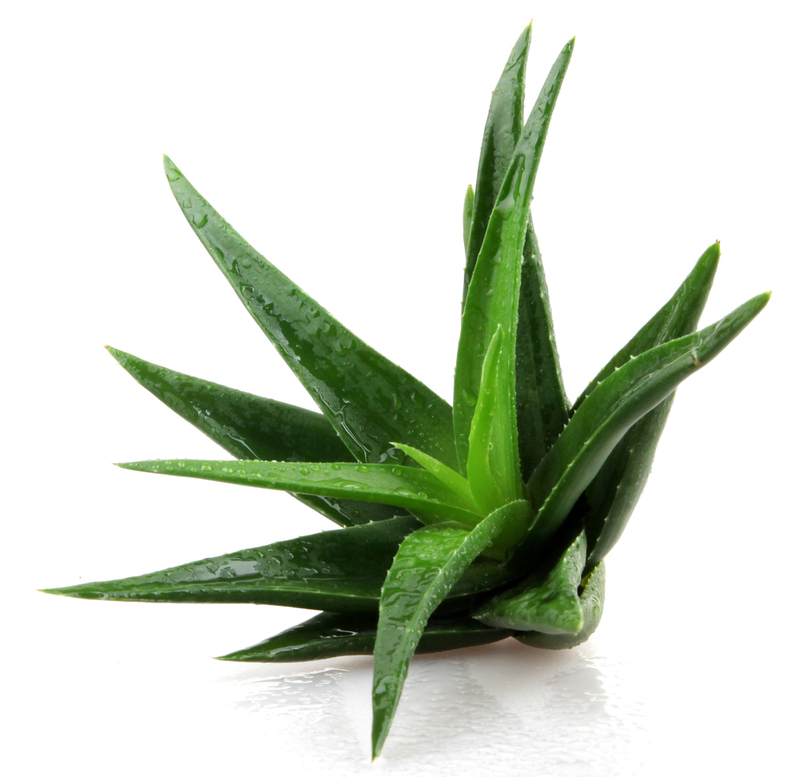 Aloe Vera– Aloe has been used since Biblical times to treat many wounds, burns, skin irritations and even constipation. It was also used as a perfume, and used to embalm the dead. Now a days, when used in soaping and cosmetics, aloe vera can be used to treat sunburns, acne, skin aging, and stretch marks. It is also used as a moisturizer, and has over 75 different nutrients such as enzymes and amino acids that help to keep you healthy. Hyssop- Hyssop was used in the Old and New Testaments as a cleansing agent. It was used in Israelite ceremonial rituals as an inner cleanser. 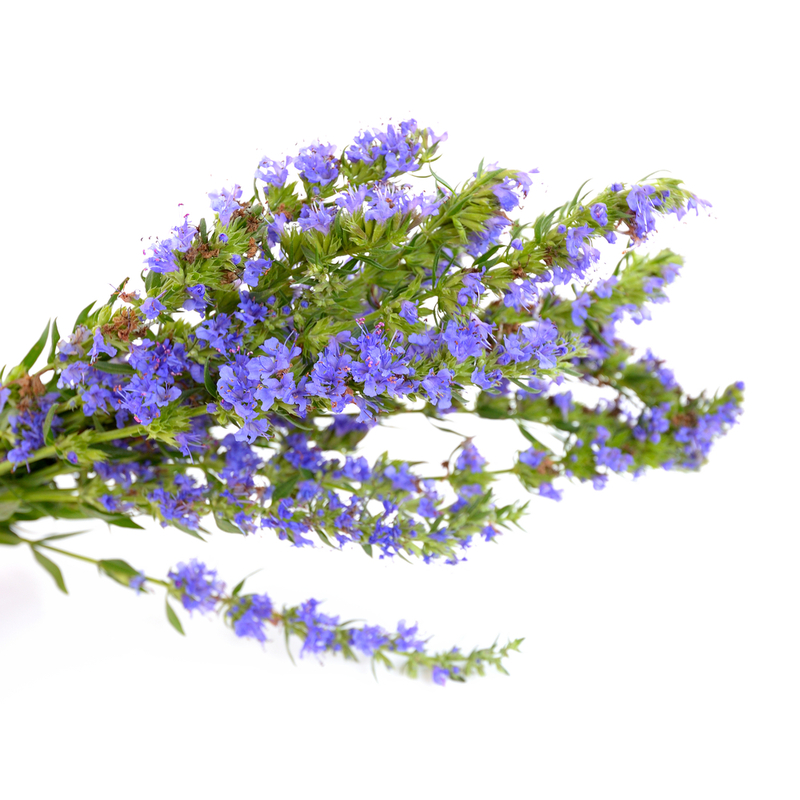 Now hyssop can be used to treat bronchitis, bruises, and coughing. It also helps to inhibit sweating, increase or induce menstrual flow, and has anti-fungal and anti-spasmodic properties. Myrrh– In the Bible, myrrh is one of the gifts the three wise men brought for the baby Jesus. It was also used as a salve to purify the dead and as an ingredient for anointing oil in the Tabernacle. Myrrh has anti-fungal, anti-inflammatory, antiseptic, and antibiotic properties. 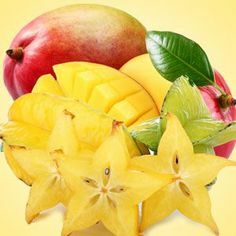 It can be used in cosmetics and bath and body products to preserve the complexion, reduce swelling, skin rejuvenation, reduce wrinkles and to treat canker sores, bad breath, blisters, gum disease, sore throats and even bad breath. Saffron- In ancient times, saffron was coveted for its’ distinct yellow color. It was used as a dye and for food flavoring. It was also used medicinally to treat bubonic plague, upset stomach, and smallpox. 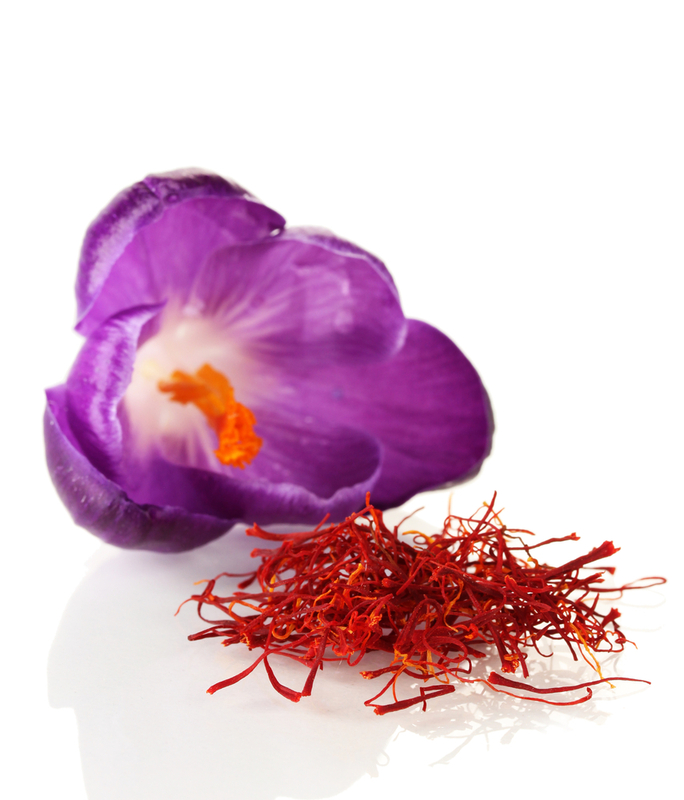 Today, saffron can be used in cosmetics to help to smooth and brighten skin, cure acne, stop hair loss and promote new hair growth. 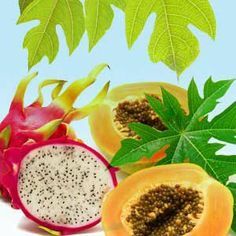 It can also be used medicinally to treat depression, allergies, cancer, and help dieters to feel full. 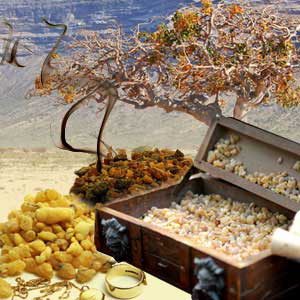 Frankincense– This herb, along with myrrh, was one of the gifts for baby Jesus from the three wise men. It was used during ceremonial offerings in biblical times, as a way to fumigate peoples’ homes, and it was considered an article of luxury. In candles and cosmetics, frankincense is used to reduce lung and sinus congestion, treat wounds, rejuvenate skin, fight bacterial and fungal infections, and to treat acne. It can also reduce wrinkles and repair scarring. 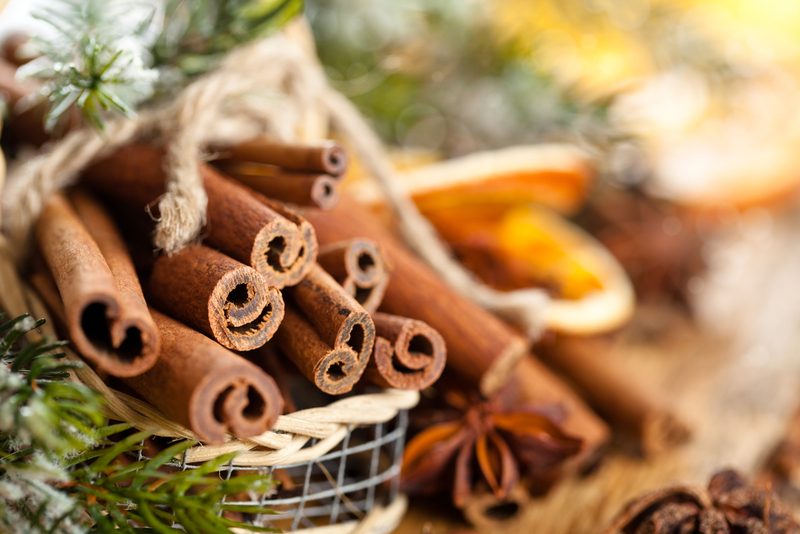 Cinnamon– Cinnamon was once considered more valuable than gold. It was used for perfumes and was an ingredient in anointing oils. 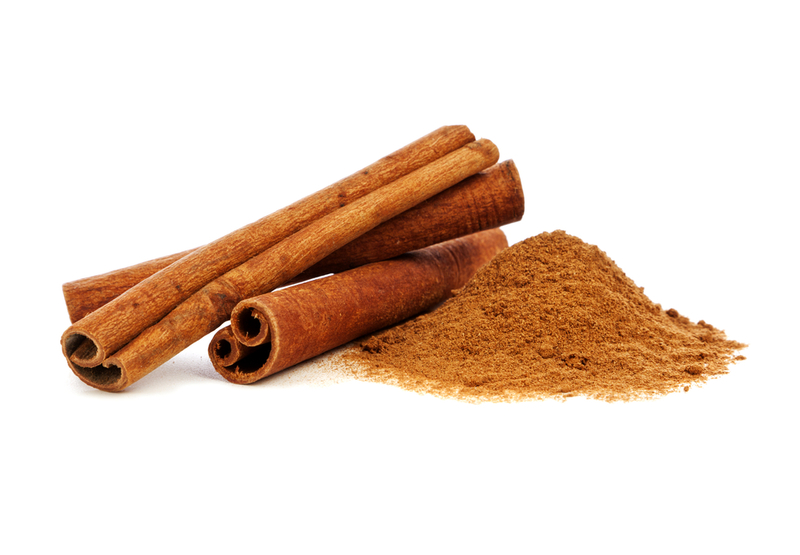 Now cinnamon can be used in cosmetics to inhibit the growth of fungi, treat acne and eczema, plump the skin, promote hair growth, and it can be used to relieve an itchy scalp. 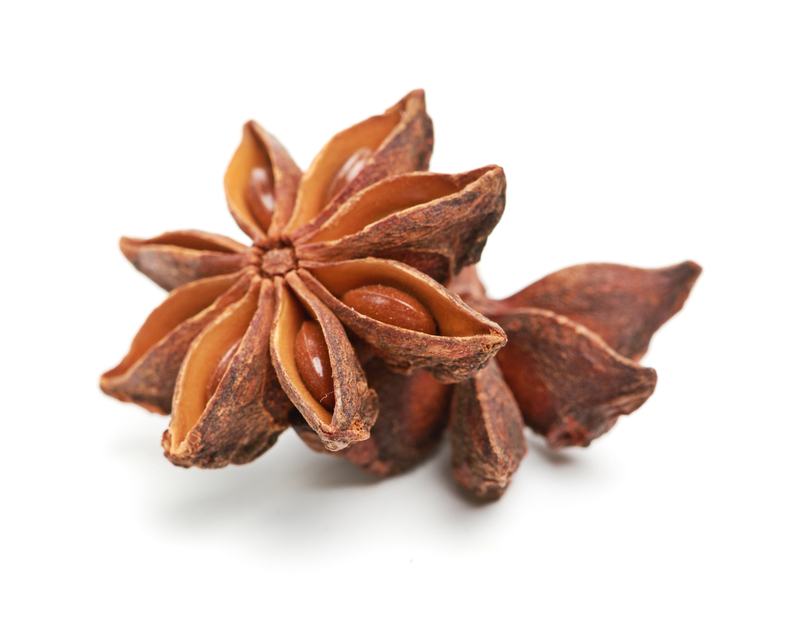 Anise– All parts of this plant were used in biblical times. It was considered so valuable that it was even used as currency. It was also used for tithes and offerings. Anise was also used as a medicine for flatulence and to avoid indigestion. In soaps, anise can be used for exfoliation and to bring some natural color. In cosmetics it is used to treat oily skin, coughing, body odor, and it is used as a natural antacid. 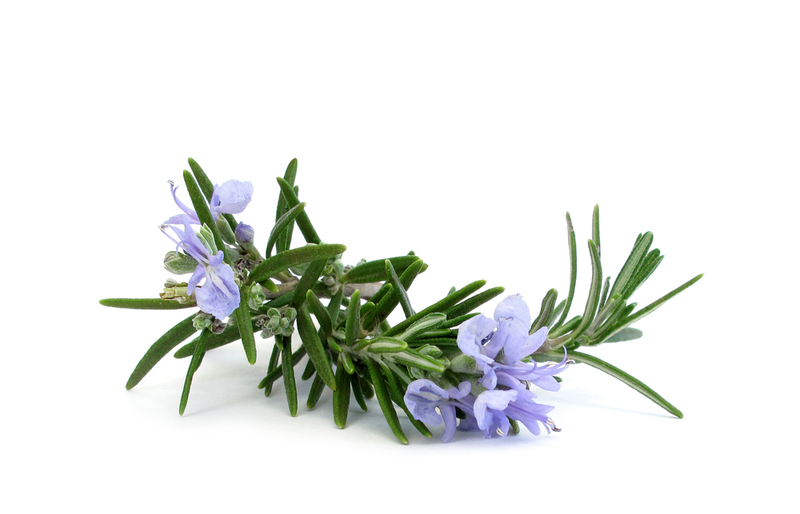 Rosemary– Rosemary signifies love, remembrance, and friendship. It was used in ancient times to cleanse altars and placed underneath beds or in love satchets as protection from harm. One story tells that all of the rosemary flowers turned from white to blue when Mary was fleeing from Herod’s soldiers with the baby Jesus. It can be used as a natural decoration for candles. 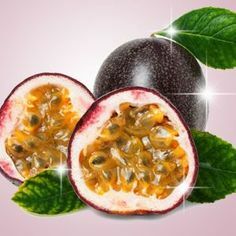 It has antioxidant and antiseptic properties so when used in cosmetics, it reduces wrinkles and removes dead skin. It also treats bruising and relieves arthritis pain. 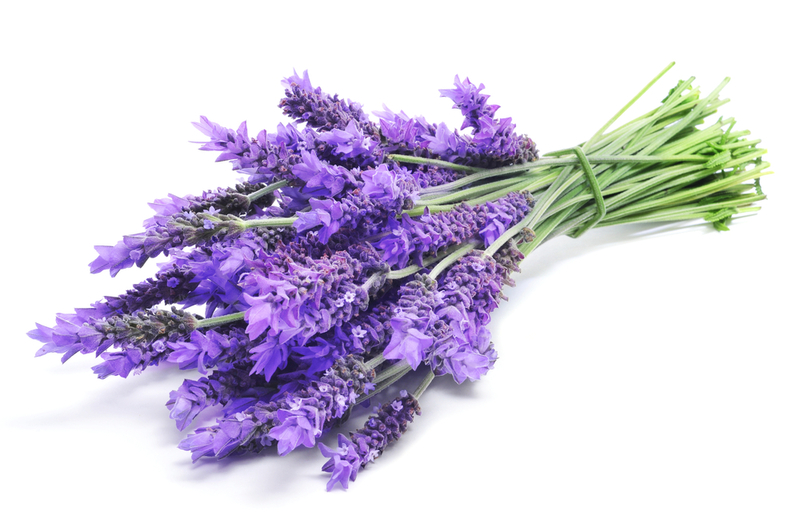 Lavender– When referenced in the Bible, lavender is actually called spikenard. Mary used it to anoint the feet of Jesus and it was regarded as a way to protect people from evil. It can be used is cosmetics and soap for its anti-inflammatory, antiseptic, and anti-bacterial properties. It is used to treat eczema, acne, psoriasis, and oily skin. In bath teas and facial masks it is used as a relaxant and to soothe skin. 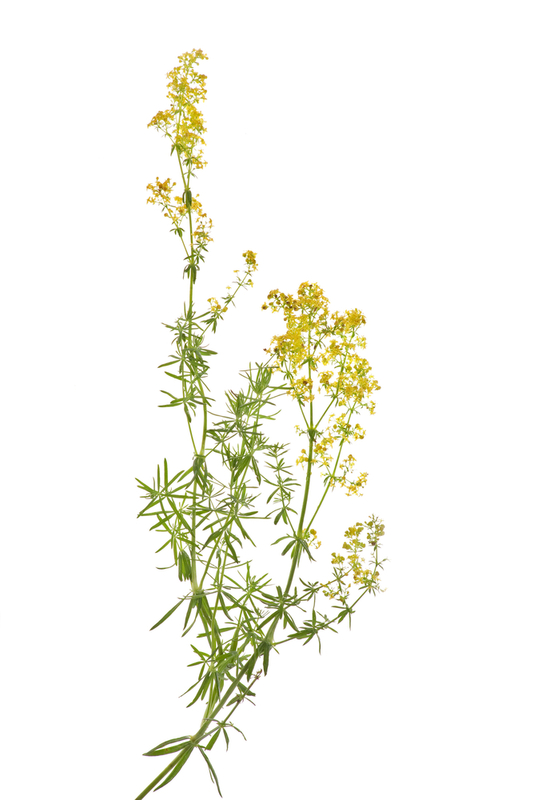 Lady’s Bedstraw- otherwise known as Madara or galium verum. It is said that Mary actually prepared the manger for the Christ child using this herb. 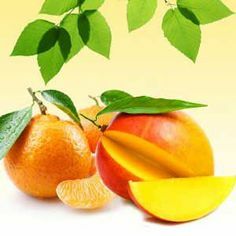 It is rich in antioxidants that slow down skin aging and it also helps to reduce wrinkles. It has many skin rejuvenating, anti-inflammatory, and antiseptic properties. All of these herbs in the Bible were used for specific and unique reasons! They are perfect to use for any holiday gift or project! Enjoy them all and watch out for more Enlightened by Layla! This entry was posted in candle making supplies, Christmas Scents, Fragrance Oils, Natures Garden, Natures Garden Fragrance Oils, Soap making supplies and tagged bath and body, bath and body products, bath bombs, body safe fragrance oil, candle fragrance oil, candle making, candle making supplies, candle scents, candles, childhood wholesale fragrance oils, christmas bath bombs, christmas crafts, Christmas fragrances, christmas ideas, christmas recipes, Christmas scents, christmas time, christmas tree bath bombs, cold process soap scents, crafts as a hobby, crafts for christmas, fragrance oil, fragrance oils, fragrances for christmas, free christmas recipes, free recipe, homemade, house smell good, kringleberry fragrance, kringleberry scent, natures garden, scents for christmas, scents for soap, soap fragrance oils, soap making, soap making supplies, soaps, time for christmas, wholesale fragrance oils on November 17, 2014 by Deborah Ward. Kringleberry scent is a fantastic holiday fragrance that is perfect for anyone looking to bring another side of Christmas into their home! If you remember, what is Santa Claus’ real name supposed to be? Kris Kringle! So how could we not come up with a fragrance dedicated to the big guy himself? Kringleberry is an awesome scent that everyone around you, including all the kiddos are sure to love for this holiday season! Once they watch all the Christmas movies over and over again, they will realize how important Mr. Kringle really is to Christmas! Kringleberry scent is perfect for any gift or project for the Christmas season! What Does Kringleberry Smell Like? 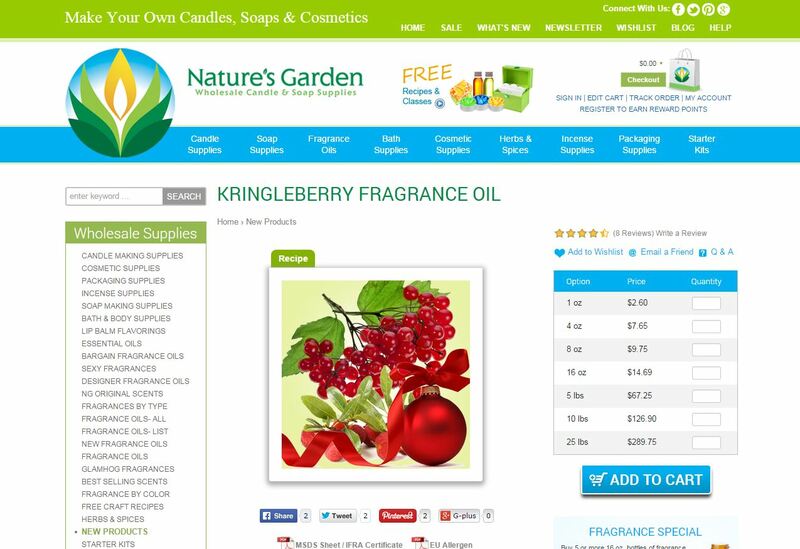 Kringleberry by Nature’s Garden is actually a Nature’s Garden original fragrance! The aroma of juicy delicious apples, red currants, fruity cranberries, sprigs of cherry and bright hollyberry, fresh cut evergreen, and delicated winter white florals all combine together for the perfect festive and merry scent! 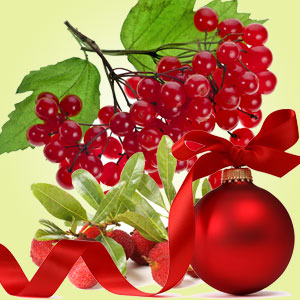 How Do Our Customers Use Kringleberry Fragrance Oil? With the big guy working over time to get ready for his busiest day of the year, a scent named after him is the perfect way to honor Santa himself! Kringleberry performs perfectly in wow wax and joy wax, and is also very nice and strong in soy wax. If you would like to have this holiday scent wafting through your whole house, use it in some nice and strong aroma beads! It also has a maximum usage rate of 50% for potpourri and incense! For bath and body products, Kringleberry has a maximum usage rate of 5%. It can be used in many common household products such as perfumes, lotions, bath gels, bath oils, and soaps! 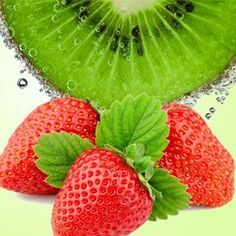 Kringleberry also has a 0% vanillin content, meaning that it will not discolor your soaps or other bath and body products at all! For all of you CP soapers out there, Kringleberry is the perfect scent to help you celebrate this holiday season! 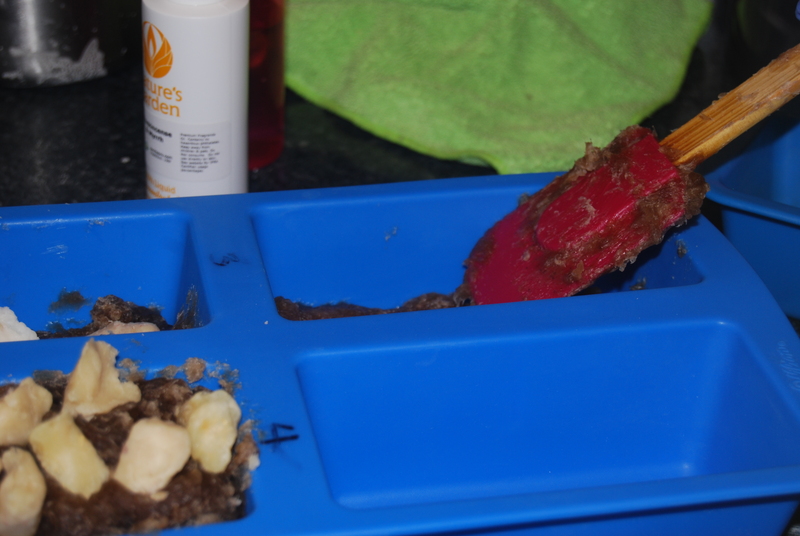 Our CP findings are: no acceleration, separation or discoloration, a slight ricing occurs, and most of the oil absorbs right back into the soap! And best of all, the smell is absolutely amazing! However, for any new soapers, we suggest using the Hot Process method as opposed to the Cold Process. Kringleberry scent is definitely the perfect fragrance to use for all of your Christmas gifts or products for the holidays! But it gets even better! 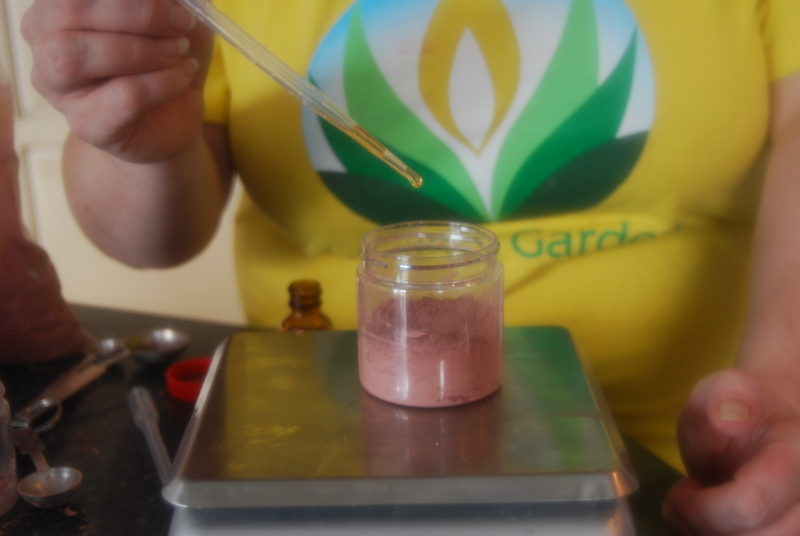 Here at Nature’s Garden, we offer many free recipes and classes. But our free recipe for our Christmas Tree Bath Bomb just happens to be made with Kringleberry fragrance! Make sure to try out this wonderful recipe! Wondering how to easily find these great holiday products? Just type “kringle” right into the search bar on our site and it will take you directly to our Kringleberry Fragrance Oil page! On top of the fragrance picture is a little green box that says “Recipe.” That little box is a link that will show you the name and picture of our Christmas Tree Bath Bomb! That link will take you directly to the free recipe! Enjoy all of our amazing holidays products and watch out for more Enlightened by Layla! This entry was posted in candle making supplies, Christmas Scents, Fragrance Oils, Natures Garden, Natures Garden Fragrance Oils, wholesale fragrance oils and tagged candle making, candle making supplies, candle scents, candlemaking supplies, candles, candles for christmas, childhood wholesale fragrance oils, christmas, christmas candles, christmas crafts, christmas fragrance, christmas fragrances for gifts, christmas fun, christmas gift ideas, christmas ideas, christmas present ideas, christmas products, Christmas scents, christmas time, christmas tree, christmas tree fragrance, christmas tree scent, crafts as a hobby, crafts for christmas gifts, Enlightened by Layla, fragrance oil, fragrance oil spotlight, fragrance oils, fragranceoil, free recipe, holiday scents, homemade, house smell good, natures garden, time for christmas, wholesale fragrance oils on November 15, 2014 by Deborah Ward. Christmas Tree scent is an amazing holiday scent that is sure to remind you of many many Christmas past! Its’ delightful smell is sure to make your brain go crazy with the thoughts of decorating the tree, buying presents, eating Christmas cookies and the anticipation for all of the new and exciting presents under the tree! It is definitely one of Santa Claus’ himself favorite scents, and how could it not be! It is a smell that is specific to his famous day of the year! Christmas Tree is perfect for any new holiday creations or gifts for your loved ones! What does Christmas Tree Smell Like? Christmas Tree is the smell of fresh pine, just like a real Christmas tree! Decorate your home with the smell of fresh lime and pine, middle notes of pepper and cardamom, and a base note of Scotch pine! This fragrance is sure to put you right into the holiday spirit and want to decorate your own tree as soon as possible! How Do Our Customers Use Christmas Tree Fragrance Oil? With the sound of the jingle bells on Santa’s sleigh getting closer and closer each day, Christmas Tree is the perfect scent for you! It is nice and strong in soy wax, and performs perfectly in wow wax and joy wax! You can also bring the scent of a beautiful pine into your home by using this fragrance in some nice and strong aroma beads! Christmas Tree also can be used in potpourri and incense with a maximum usage rate of 50%! For bath and body products however, Christmas Tree scent is not body safe. So please do not attempt to use it in any soaps, lotions, bath gels, or any other kind of bath and body product. Christmas Tree scent just happens to be one of Nature’s Gardens’ many original fragrances! Meaning this fragrance was made and created specifically by us! A candle with the scent of a Christmas tree is the perfect gift for you to give any of your friends, family, and other loved ones for this Christmas season! Christmas Tree is definitely a scent that you could use in your own candles that will keep your customers coming back again and again! It sure to bring them all reminders of past Christmas seasons and all the holiday joy! Are you wondering how to get your hands on this fantastic Christmas scent as soon as possible? Well, all you have to do is type “chris tree frag” into the search bar on our website! 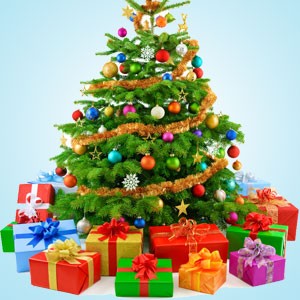 That will take you directly to our Christmas Tree Fragrance Oil page! This is a fragrance that you definitely cannot pass up this holiday season! And be sure to check out all of our free recipes as well! You are sure to find some amazing recipes that you can use as other perfect holiday gifts for your family and loved ones as well! Please don’t hesitate to contact us with any thoughts, questions, or concerns, and make sure to watch out for more Enlightened by Layla! This entry was posted in bath and body, Christmas Scents, free recipe, Natures Garden, Natures Garden Fragrance Oils, Soap making supplies and tagged bath and body, bath and body products, body safe fragrance oil, christmas, christmas crafts, christmas fun, christmas gift ideas, christmas gifts, christmas gifts for everyone, christmas ideas, christmas recipes, Christmas scents, christmas smells, christmas soap, christmas soap recipes, christmas time, christmas time fun, christmas time ideas, crafts for christmas, crafts for kids, crockpot soap, fragrance, fragrance oils, frankincense and myrrh, frankincense and myrrh soap, frankincense soap, free christmas recipes, free soap recipes, hot process soap, house smell good, how to make hot process soap, how to use myrrh gum in soap, myrrh soap, soap, soap making, soap making supplies, soapmaking, soaps, three wise men gifts on November 14, 2014 by Deborah Ward. Hello everyone! Are you looking for a new wonderful project to try for this Christmas season? Maybe a new recipe to try as a unique and beautiful gift to give to all of your loved ones for the holiday? Well do we have the perfect one for you! 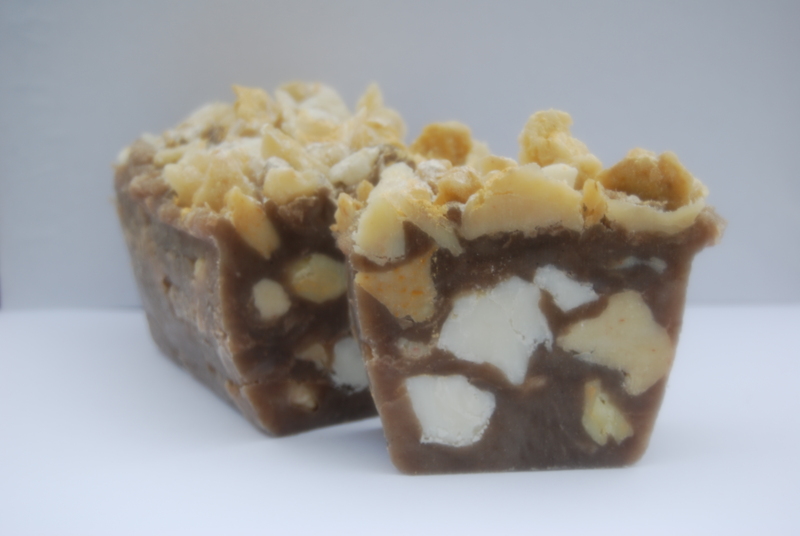 I would like to introduce our new free recipe for our Frankincense and Myrrh Soap! This Christmas soap is made with the thoughts of the three wise men in mind! If you remember the story of the baby Jesus, the three wise men all traveled to see him toting three special gifts. Gold, frankincense, and myrrh. This soap is a gorgeous way to pay homage to that special holiday story! There are actually 2 parts to this soap, you will start out by preparing the rock portion first. 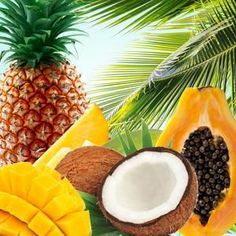 In a bowl, weigh out 34 grams Castor Oil, 204 grams Coconut Oil 76, 204 grams Palm Oil, 34 grams Mango Butter, and 204 grams Olive Oil Pomace. 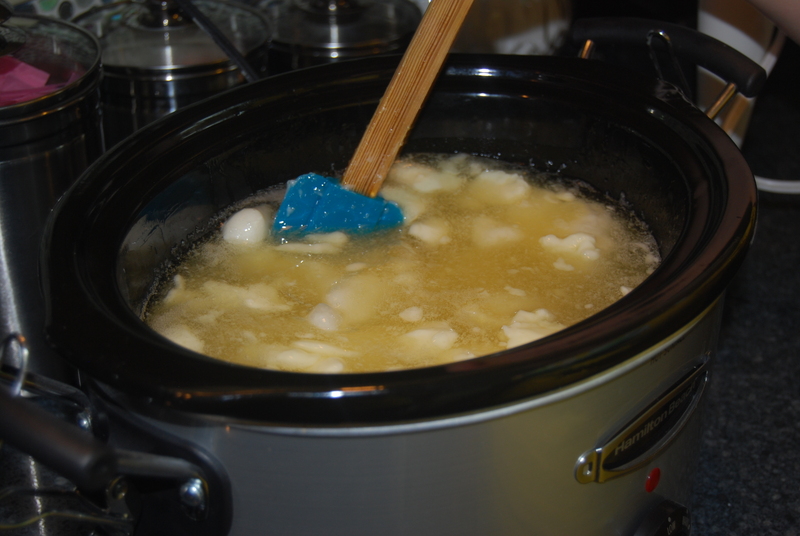 Turn the crockpot on low, and heat all of the oils until they are completely liquid. 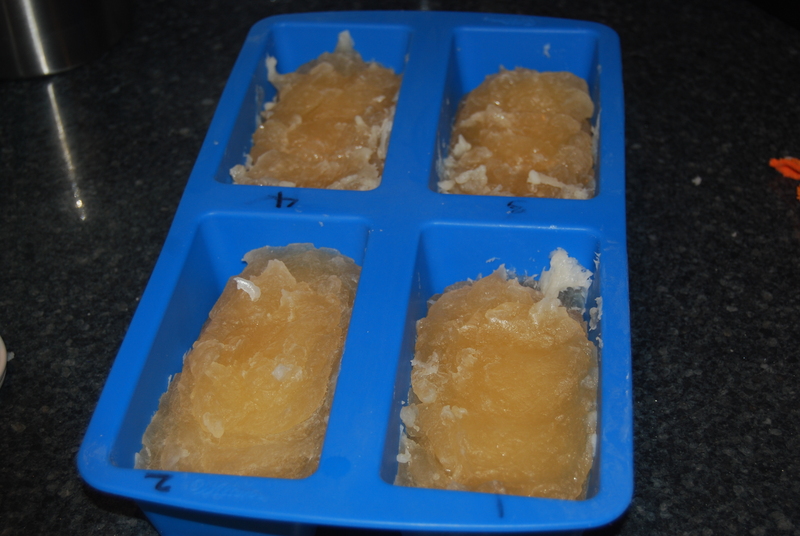 While you are waiting for them to melt, weigh out 97 grams of lye and 258 grams of distilled water. 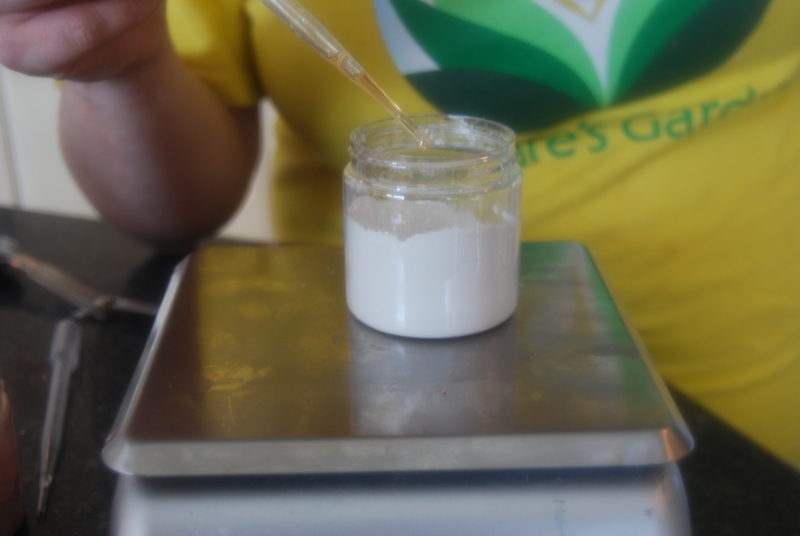 Slowly and carefully pour the lye into the water and then stir. Never add water to lye! Then once the oils are melted, add the lye to them in the crockpot. 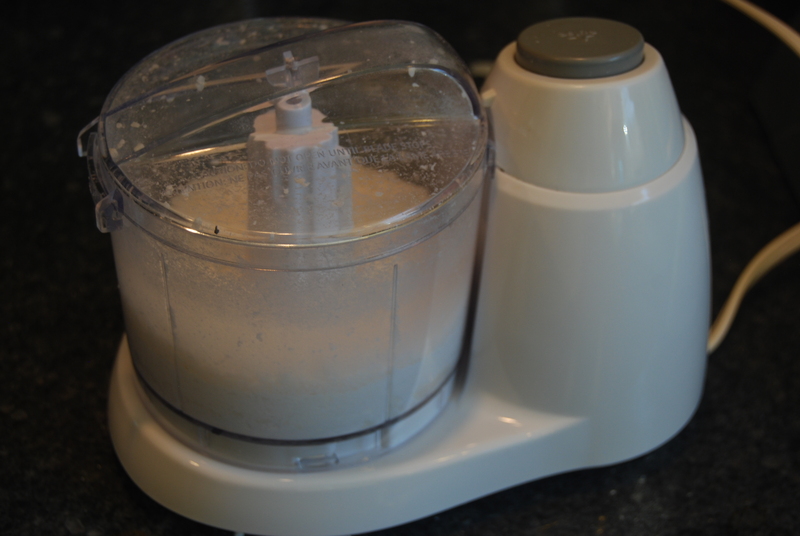 Use the stick blender to bring the mixture to a pudding consistency. Place the lid on the crockpot and allow to cook. Make sure to keep stirring the mixture every now and then. 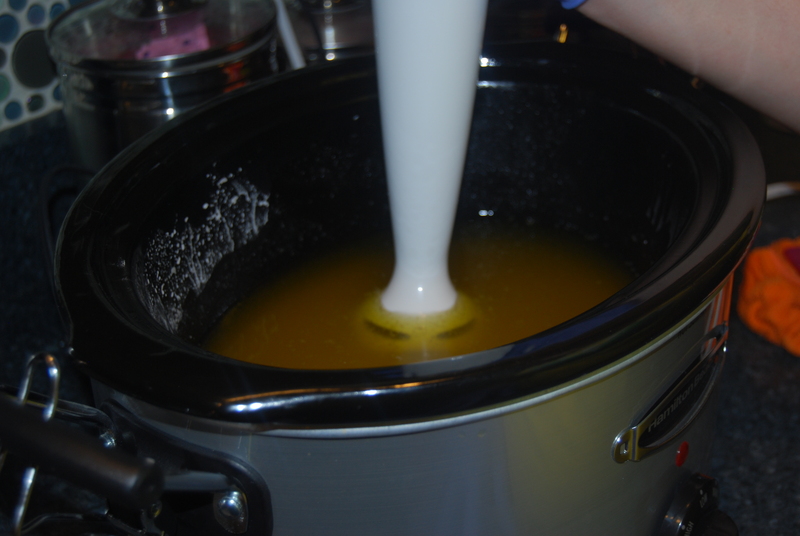 Once it has reached the consistency of mashed potatoes, the soap is finished. 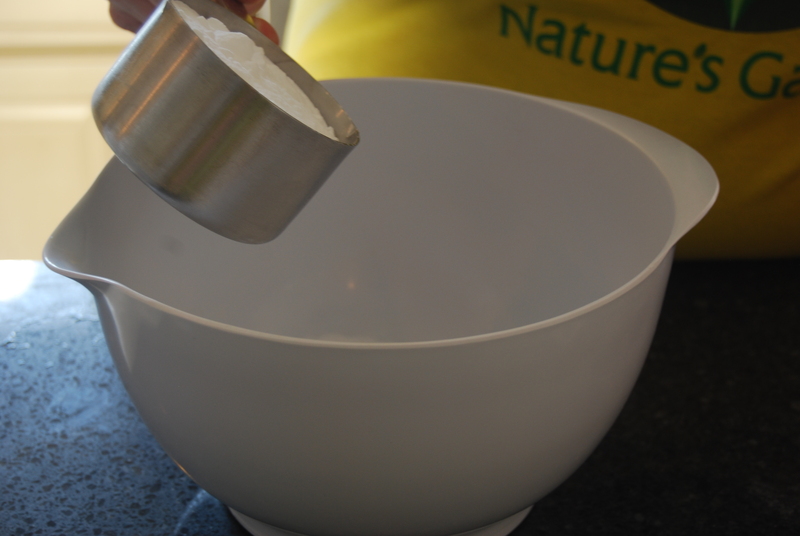 When the soap is finished cooking, divide it equally into 4 mixing bowls. Add 2 drops of Orange Oxide Colorant into one bowl, 2 drops of Yellow into one, 2 drops of brown into the third, and do not color the fourth bowl. 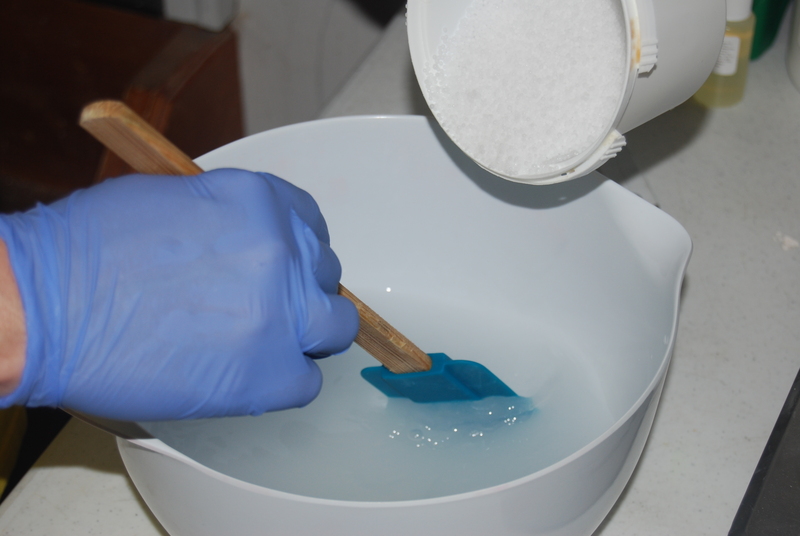 Then, pour each bowl into a different part of the soap mold and let the soap sit to set up. 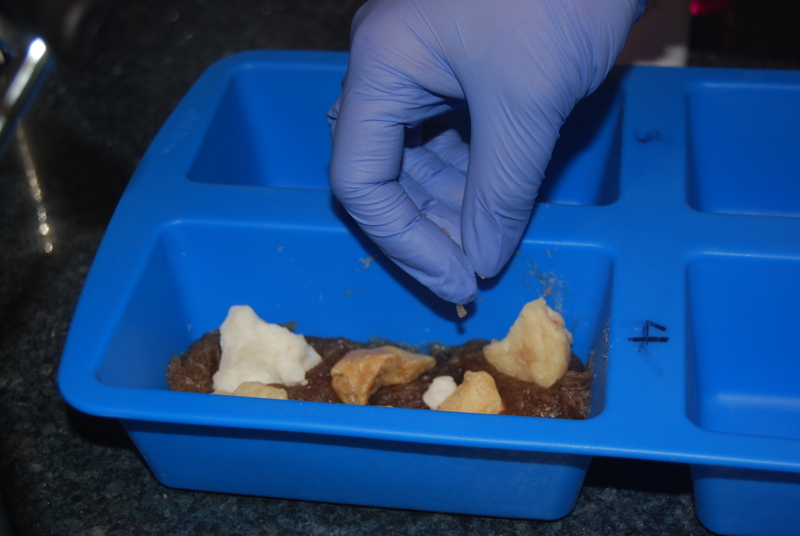 After it has set, break the soaps up into pieces and set aside to use later for the rocks. Now you can start the brown portion of your soap. 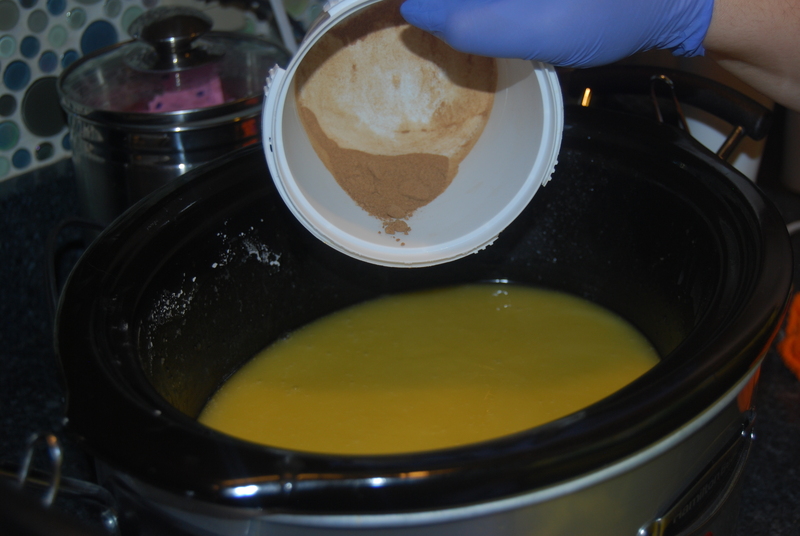 In the crockpot, melt down 51 grams Mango Butter, 306 grams Olive Oil, 306 grams Coconut Oil 76, 51 grams Castor Oil, and 306 grams Palm Oil. 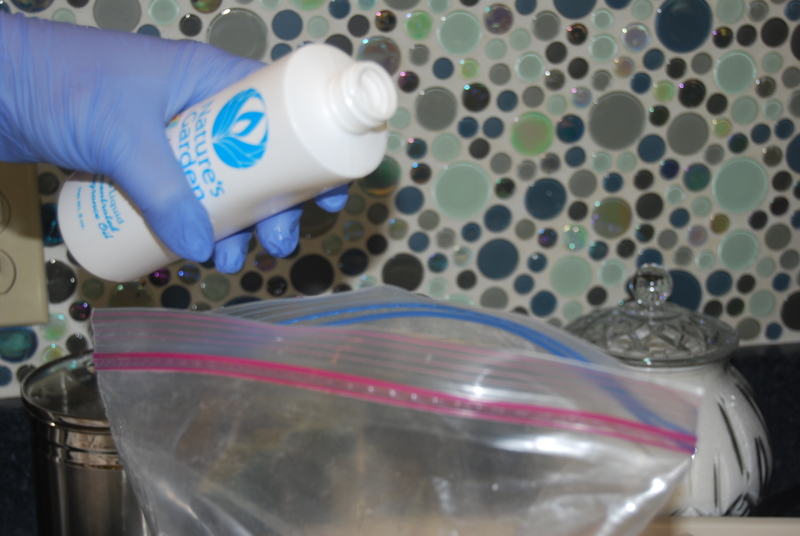 Prepare your lye water again, (same process as Step 2) using 387 grams distilled water and 146 grams lye. Stir. 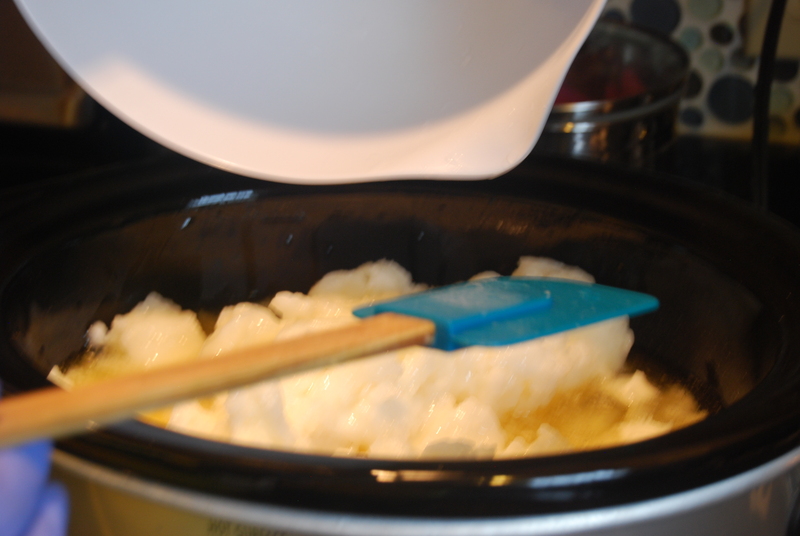 When the oils are melted, add the lye to the crockpot and stir with the stick blender. This should become about a pudding consistency. 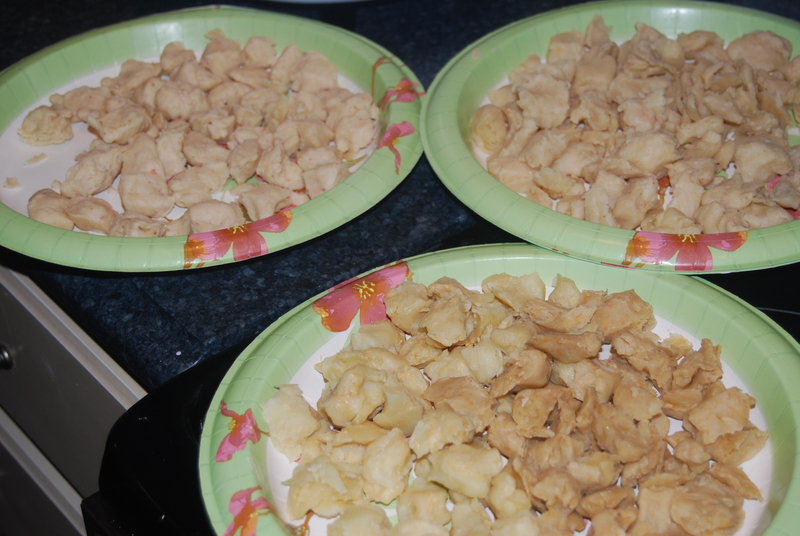 Let it sit for about 15 minutes and then add your 6 grams of Myrrh Gum Powder and mix it again. Allow your soap to finish until it is again a mashed potato consistency, add 84 grams Frankincense and Myrrh Fragrance Oil, and mix together. 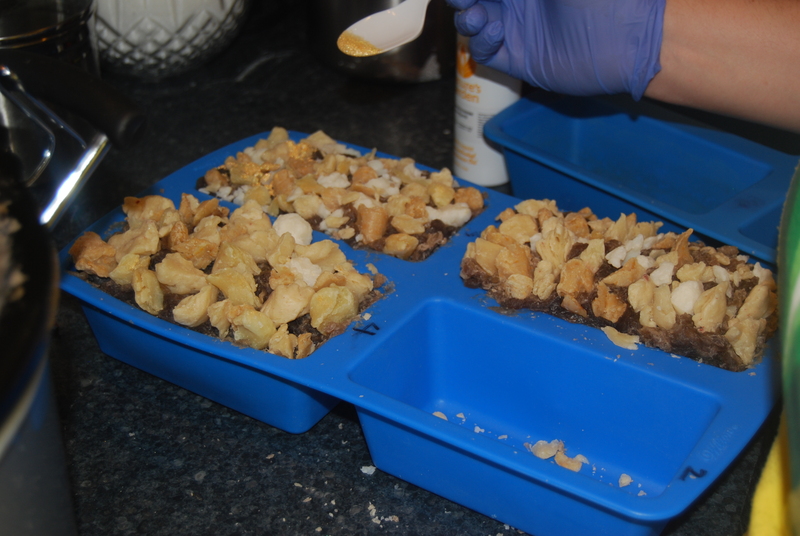 Now using the 4 loaf mold, put a layer of soap into the bottom of 3 of the different parts of the loaf. Then using the rocks from earlier, place the rocks throughout that layer, pushing them down slightly to prevent air pockets. Put another layer on top and keep repeating the process until you fill the mold. Once you have filled the mold, sprinkle 24K Gold Mica Pigment and Diamond Dust Mica Pigment on top until you are satisfied with the amount, and let it sit for a while to set up. Enjoy your awesome new Frankincense and Myrrh Soap! This Christmas soap is the perfect gift for all of your loved ones for Christmas time! It is an awesome reminder of what the season is really all about! Enjoy and watch out for more Enlightened by Layla! This entry was posted in Fragrance Oils, free recipe, laundry detergent, laundry detergent recipe, Natures Garden, Natures Garden Fragrance Oils, Soap making supplies and tagged bath and body products, body safe fragrance oil, body safe fragrance oils, borax in detergents, crafts as a hobby, detergent, easy laundry detergent, fragrance oil, fragrance oils, free detergent recipe, free laundry detergent recipe, free recipe, homemade, homemade laundry detergent, homemade laundry detergent recipe, homemade laundry soap, house smell good, how to make laundry detergent, how to make laundry soap, how to make powdered laundry detergent, laundry detergent, laundry detergent recipe, laundry powder, laundry soap, laundry soap recipe, make powdered laundry soap, make your own laundry detergent, make your own laundry soap, natures garden, soap fragrance oil, soap making, soap making scents, soap making supplies, soaps, wholesale fragrance oils on November 13, 2014 by Deborah Ward. Homemade laundry detergent is so easy to make! Do you like to use your crafting abilities to save yourself money? Like a lot of money? Oh yes, it is absolutely possible! If you are drooling at the idea of using your creativity to save yourself some money, then make sure to try this new recipe as soon as possible! Have you ever made homemade laundry detergent? Like I said, it is a huge money saver to create your own instead of buying a name brand or expensive brand of laundry detergent from the grocery store. As an added bonus you can scent it with your very favorite fragrance! 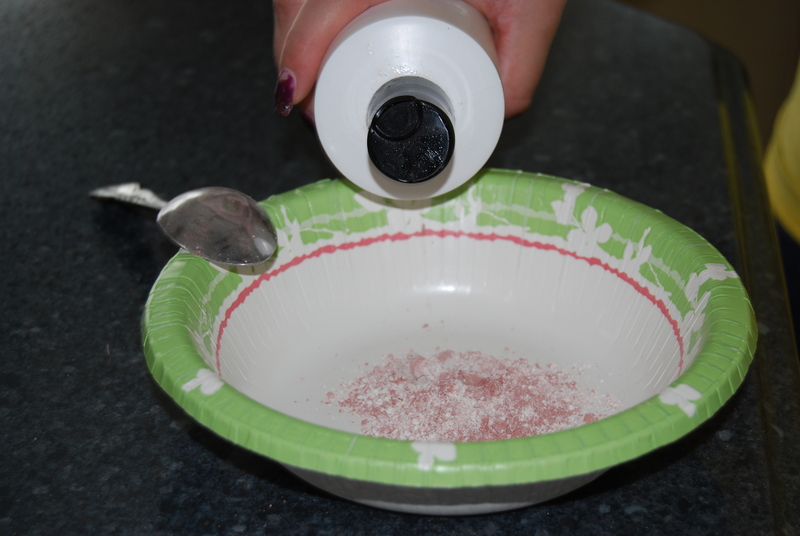 So here is a brand new recipe we have created for our Powdered Laundry Detergent! Always make sure to wear your safety equipment when working with lye! First, weigh out your 544 grams of Palm Oil and 1270 grams of Coconut Oil 76 and mix them together carefully. 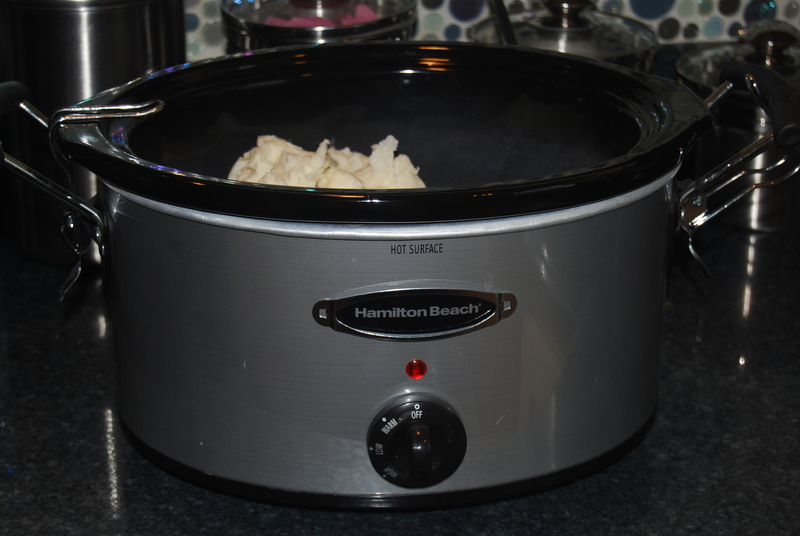 Turn your crock pot onto the lowest setting and then you can pour your oils into the crock pot. Next you will start your lye. Start by weighing out 689 grams of water. Then carefully add your 294 grams of lye to your water. Never add water to lye, always add the lye to water! Then mix it together carefully. 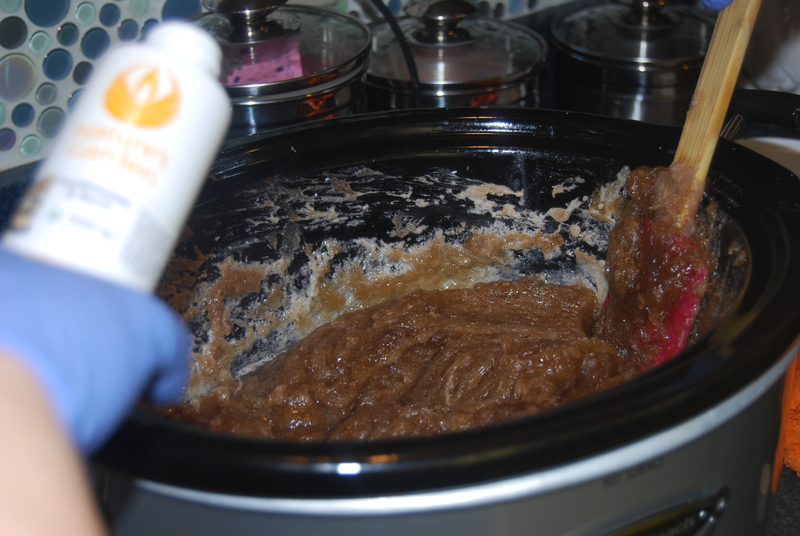 After your lye water is mixed, you can pour it into the crock pot with your oil mixture and then put the lid on the crock pot. Next, let it sit on the lowest setting for about two hours until it reaches the consistency of mashed potatoes. Make sure to stir it occasionally. 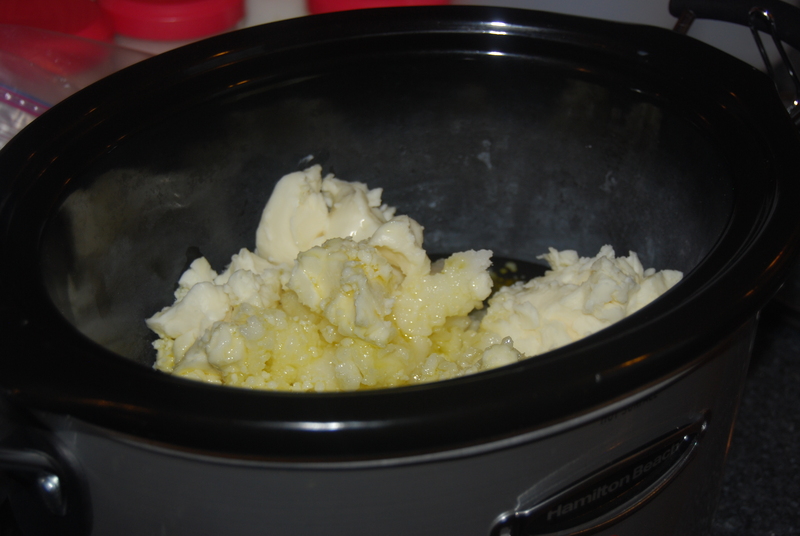 When it reaches the mashed potatoes consistency, place the soap into the molds and let it set so it can set up. Once the soap is set up, break it up into pieces. Heat your oven to 400 degrees Fahrenheit and then put 525 grams of baking soda into a clear cake pan and bake the baking soda in the oven for about half an hour to make washing soda. This changed the chemical composition of the baking soda to washing soda. After the 30 minutes is over, your baking soda should now be washing soda. 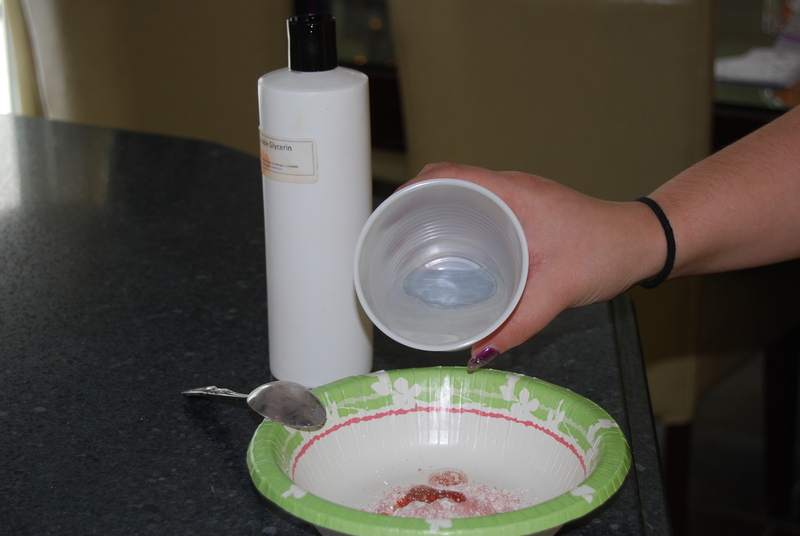 Using a mixing bowl, weigh out and mix together 525 grams of the washing soda and 288 grams of borax. In the food processor, grind up 312 grams of the broken up soap with a few tablespoons of the borax and washing soda mixture. 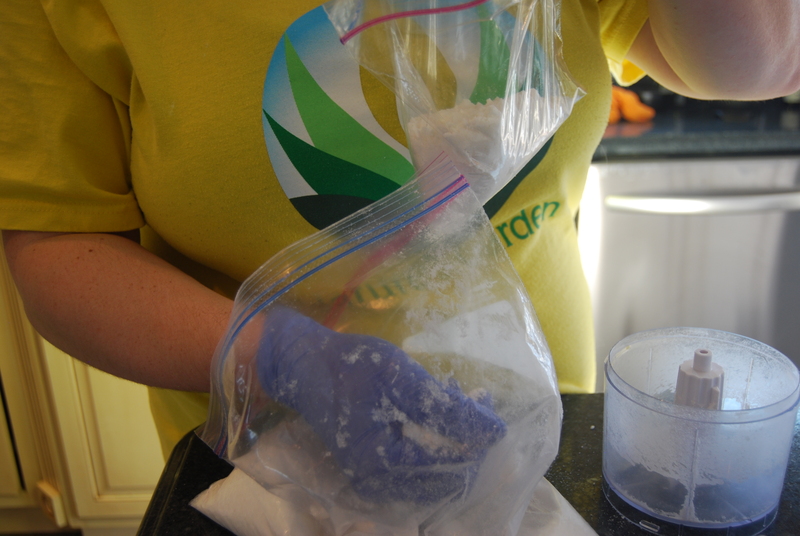 Then pour the soap, 56 grams of Snuggable Fragrance Oil, and the rest of washing soda and borax mix into the ziplock bag. Seal the bag and shake it all up! 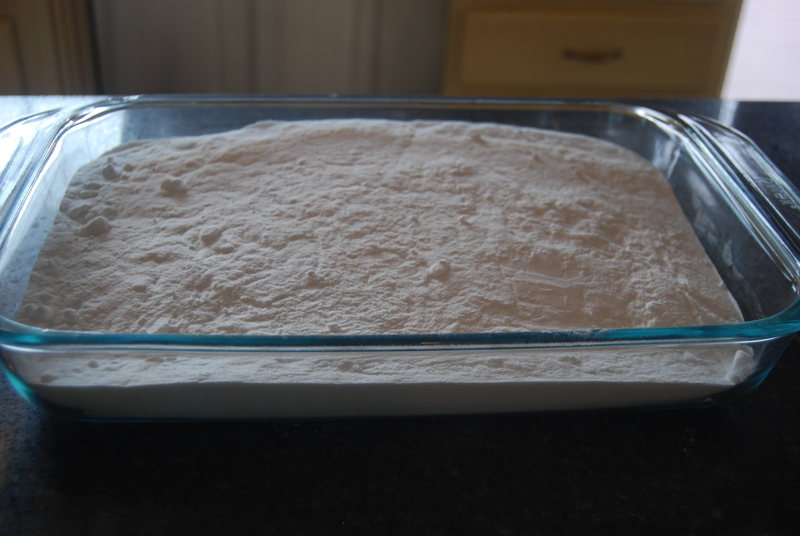 Once it is all shaken up, you can pour the powder into a sandwich baggy. 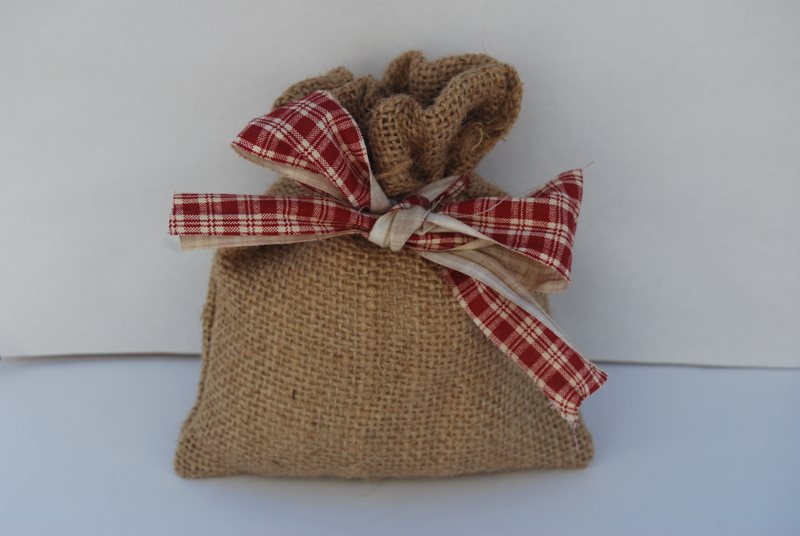 Finally, put the sandwich baggy into the burlap bag and decorate with your ribbon! Your Powdered Laundry Detergent is now ready for you to enjoy! Make sure to also check out our free recipes for our Delicate Powdered Laundry Detergent, our Heavy Duty Laundry Soap, and our Delicate Laundry Soap! And check out our free Baking Soda Class as well! Enjoy them all and be sure to watch for more Enlightened by Layla!